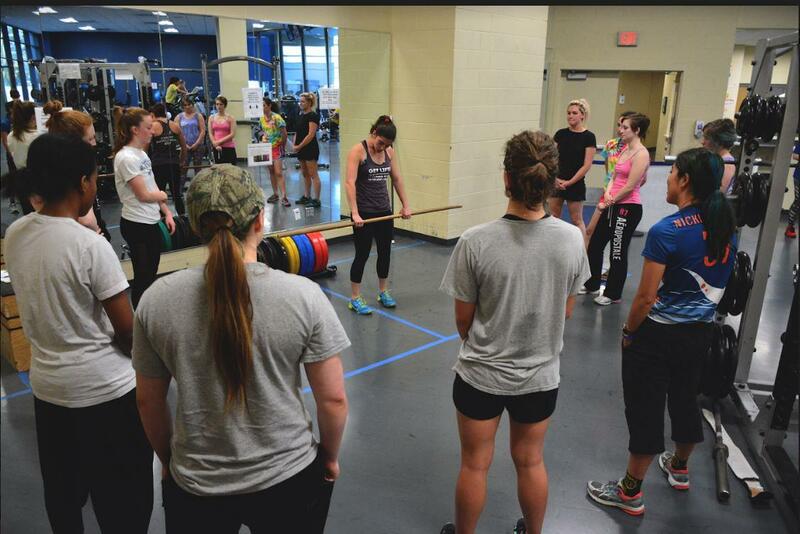 Students gather around an instructor demonstrating how to properly deadlift at Women’s Weightlifting Week last year. Women’s Weightlifting Week returns to UNC Asheville this spring with a week full of lectures and workshops on building strength and empowerment. Senior health and wellness and psychology student Julia Diesel participates in this event by attending and teaching lectures and workshops. “Women’s Weightlifting Week is fun. It is essentially in my mind a week of education and empowerment. We say that it’s Women’s Weightlifting Week because it is aimed to get females into classically male dominated environments but the workshops and lectures are opened to everyone. So in my mind the way that we empower people is we get them using the equipment, we get them educated on the topics and from there they are able to build on their own skill sets and have the efficacy to be able to do that on their own,” Diesel said. Senior photography student Caroline Dockery oversees Women’s Weightlifting Week alongside Olivia Brueckner. “Now that Aleen Dailey is on maternity leave, Olivia Brueckner and I are actually running the event. We are pretty much making sure everyone is going to their lectures or promoting the event and I am personally teaching five of the lectures. I got involved because I think it is an idea that is important. Strength training is really critical for women and I think that it brings a sense of empowerment that nothing else in your life can really give you and personally I have found a love for it,” Dockery said. Dockery has been a fitness instructor at UNCA for about two years. She finds it important for women to feel comfortable in a male dominated environment and talks about how Women’s Weightlifting Week works with that idea. Diesel said students can get involved through both in class lectures and hands on experience in the gym. “We split the week into lectures and workshops which is how we do it every year. Lectures are classroom based so you can take notes and ask questions based off the PowerPoint that is being presented. The workshops are done in the gym or in the dance studios where we have some of our group fitness classes regularly held and those are much more interactive so getting your hands on weights and practicing things yourself and this year we are doing some pretty interesting stuff I think because we usually have something on benching, something on squatting,” Diesel said. Political science student Ellie McKeon attends the event every year. “I have gone to women’s weightlifting a couple of times. I really came to college knowing nothing about the gym and working out so I started coming to group fitness classes and then they promoted the Women’s Weightlifting Week. I went to a lecture on body image and how to use the weights in the gym and it’s really helped branch my skills to work out on my own,” McKeon said. Even though the event is labeled as Women’s Weightlifting Week, people of all gender identities are allowed to attend. “Everyone is really welcome to come. Women obviously, but men as well as faculty and staff. It’s called Women’s Weightlifting Week but it’s intended for all individuals. All the lectures and workshops are taught by female faculty, staff and students but we want everyone from everywhere to come and learn,” Diesel said.